Guide Dogs of America and creative holiday fundraising! Everyone is thinking about giving during the holidays. An auction filled with "fund-a-need" items is a unique and inspired way to ask your supporters to give to your cause! A fund-a-need item is essentially a request to fund a specific need at your organization. For example, animal welfare organizations often have expenses like vaccinations or other medical treatments that need to be covered for their animals. Fund-a-need items are a great way for these charities to be able to ask for assistance. The Guide Dogs of America is an excellent example of just how effective fund-a-need items can be. Their organization trains guide dogs that will then be given to their blind partners free of charge. In order to provide this service, Guide Dogs of America must cover a range of specialized costs. 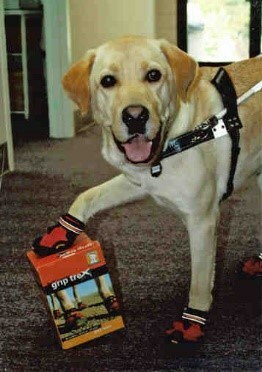 The Guide Dogs of America fund-a-need auction allows them to do that in a fun and effective way. The annual auction includes items like Microchip for a Puppy, Post-Op Dog Care, Bark’n Boots™ Grip Trex™ Dog Boots, and Puppy-Go-Home Kits. In 2014, these items inspired over $13,000 worth of donations! We've learned that donors are encouraged to make larger gifts when they know that their contribution has a specific impact. It works this way: A donor might plan to give a donation of $150 to an animal charity, but after seeing the fund-a-need items, they choose to increase the donation to $250 to cover emergency treatment for a pet. Knowing exactly what kind of difference their increase makes can prompt donors to give more. Like The Guide Dogs of America, you can make fund-a-need holiday auctions part of your end-of-year fundraising. By creating these special auctions, The Guide Dogs of America has raised at least an additional $10,000 each year since 2012. Their 4th annual holiday fund-a-need auction has just opened and will be running through the end of the year. Visit their auction to participate and for fund-a-need item inspiration! Want to be sure your organization's online auction is ready to go? Download our auction checklist!